Our Hospitality is a 1923 silent comedy film directed by and starring Buster Keaton. Released by Metro Pictures Corporation, the film uses slapstick and situational comedy to tell the story of Willie McKay, who gets caught in the middle of the infamous “Canfield”–”McKay” feud, an obvious satire of the real-life Hatfield–McCoy feud. 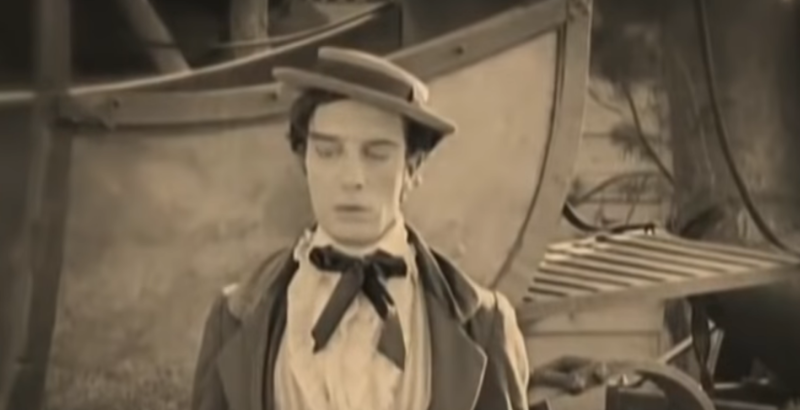 It was a groundbreaking work for the comedy film genre, as Keaton included “careful integration of gags into a dramatically coherent storyline”, “meticulous attention to period detail” and “beautiful cinematography and extensive location shooting”. This was a contrast to the usual slapstick comedies of this era. Turner Classic Movies describes Our Hospitality as a “silent film for which no apologies need be made to modern viewers” and Roger Ebert considered it Keaton’s first masterpiece. Our Hospitality is one of many works from 1923 that will enter the public domain in the United States in 2019. The Canfield and McKay families have been feuding for so long, no one remembers the reason the feud started in the first place. One stormy night in 1810, family patriarch John McKay and his rival James Canfield kill each other. After the tragic death of her husband, John’s wife decides her son Willie will not suffer the same fate. She moves to New York to live with her sister, who after the mother’s death raises him without telling him of the feud. Twenty years later, Willie receives a letter informing him that his father’s estate is now his. His aunt tells him of the feud, but he decides to return to his Southern birthplace anyway to claim his inheritance. On the train ride, he meets a girl, Virginia. They are shy to each other at first, but become acquainted during many train mishaps. At their destination, she is greeted by her father and two brothers; she, it turns out, is a Canfield. Willie innocently asks one of the brothers where the McKay estate is. The brother offers to show him the way, but stops at every shop in search of a pistol to shoot the unsuspecting Willie. By the time he obtains one, Willie has wandered off. Willie is very disappointed to discover the McKay “estate” is a rundown home, not the stately mansion he had imagined. Later, however, he encounters Virginia, who invites him to supper. When he arrives, the brothers want to shoot him, but the father refuses to allow it while he is a guest in their mansion. The father refers to this as “our hospitality”. When Willie overhears a conversation between the brothers, he finally realizes his grave predicament. A parson comes to supper as well. Afterward, the parson prepares to leave, but he finds it is raining furiously. The Canfield patriarch insists the parson stay the night. McKay invites himself to do the same. The next morning, McKay stays inside the house, while the Canfield men wait for his departure. The father catches McKay kissing his daughter. McKay finally manages to leave safely by putting on a woman’s dress. However, a chase ensues. He eventually starts down a steep cliff side, but is unable to find a way to the bottom. One Canfield lowers a rope (so he can get a better shot) to which Willie ties himself, but the Canfield falls into the water far below, dragging Willie along. Finally, Willie manages to steal the train locomotive and tender, but the tender derails, dumping him into the river towards the rapids. Virginia spots him and goes after him in a rowboat; she falls into the water and is swept over the edge of the large waterfall. McKay swings trapeze-like on a rope, catching her hands in mid-fall and depositing her safely on a ledge. When it grows dark, the Canfield men decide to continue their murderous search the next day. Returning home, they see Willie and Virginia embracing; Joseph Canfield furiously rushes into the room, gun in hand. He is brought up short by the parson, who asks him if he wishes to kiss the bride. Seeing a hanging “love thy neighbor” sampler, the father decides to bless the union and end the feud. The Canfields place their pistols on a table; Willie then divests himself of the many guns he took from their gun cabinet.